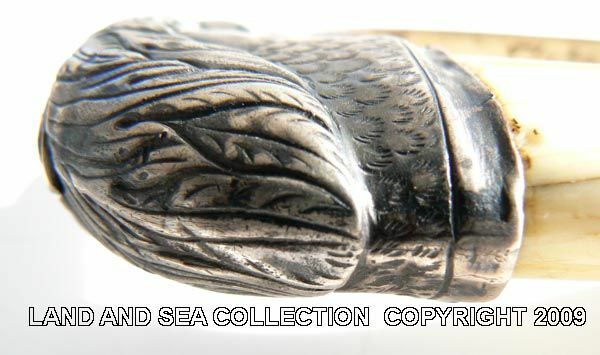 To view our current inventory of rare antique silver hilt edged weapons, click here! 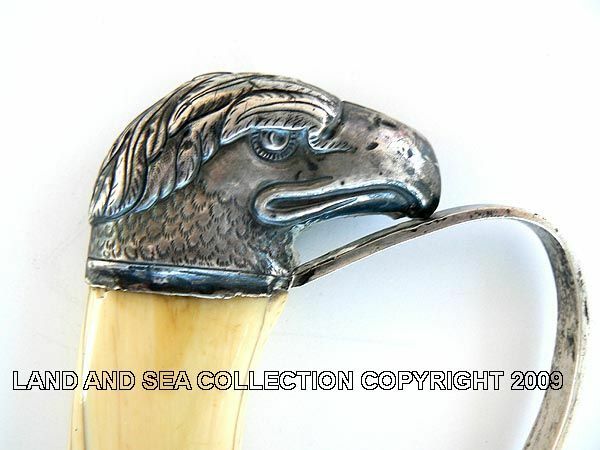 This Very Rare Silver Hilt Eagle Head Has Been Sold. Thank you! THE EAGLE HEAD: Harold E. Peterson in his "The American Sword, 1775-1945" says this about eagle heads on page 319. "Among swords with these (eagle) pommels it is easy to recognize two principal schools of influence, one in the Philadelphia area and the other in Baltimore. The Philadelphia eagle heads are long and narrow with decidedly rakish lines. They are usually made in two pieces, and may or may not have a crest of feathers at the top of the eagle head. Baltimore eagle heads are shorter more compact, resembling the domestic chicken more than an eagle. Usually, the guard is cut with some slight piercing from flat silver stock." COMPARABLE EAGLE HEADS: This eagle bears a remarkable resemblance to two illustrated in Peterson's, page 328-329, section 58 and 59. 58, Ca 1810 is unmarked and compares in style, size, and lack of decorations, but with raised edges and scrolling on the scabbard. 59, Ca 1810, made by Philip Hart, Philadelphia, Ca 1813, has the same style eagle head, but has later variations which came in to favor around 1810 and later. 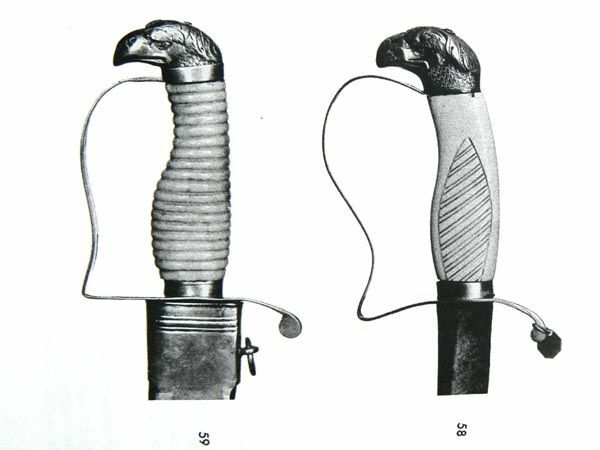 These included a blued and gilted blade and American engravings. The dimensions of both come within 1/2 inch of matching. 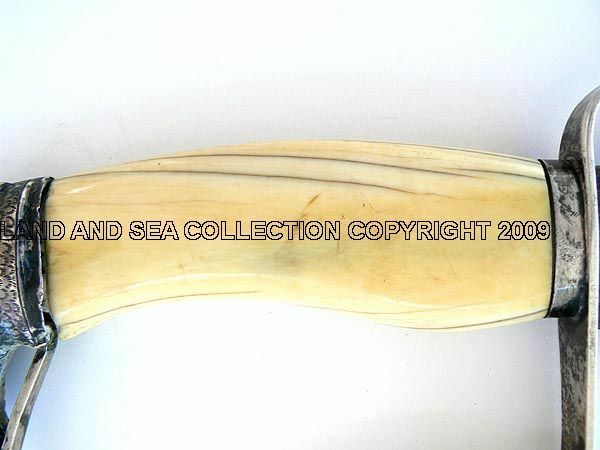 THE HILT is carved from a solid block of unblemished ivory which has a warm patina of age. 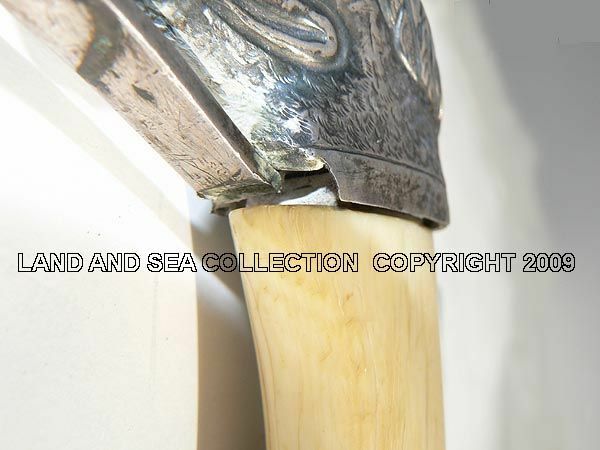 It is loose in the hilt, but secure between the simple unadorned ferule and eagle pommel. Note the reeded carving on the obverse panel which is not repeated on the reverse. BLADE: The moderately curved blade is a dark grey with rust overtones on the obverse and with about 40% of its original finish on the reverse which is a mottled polished surface with webbing. 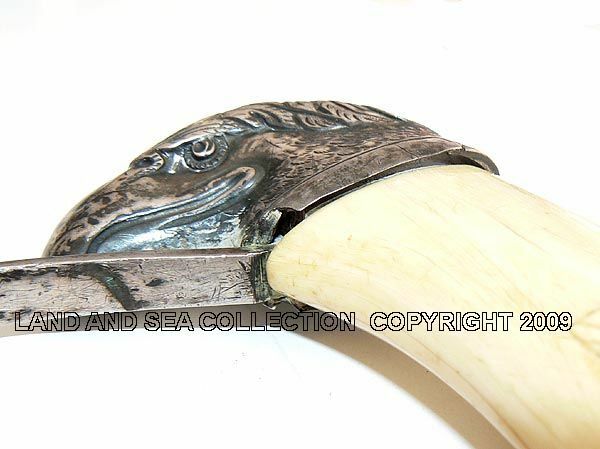 Both sides are without etching as was the norm for the early Eagle Heads. There are no maker's marks. The blade has a large single fuller 1" wide from slightly below the ricasso to 8" behind the tip. The blade is sharp for its first 15", and the false edge is sharp for 8 inches. The first ten inches show nicks from what may be combat. DIMENSIONS: Length in scabbard overall 36 1/4"
Length of blade 30" Width 1 6/16 Thickness 1/4" Length overall 35 1/2"
THE SCABBARD: The black leather scabbard is in very good condition considering its age and use, but has shrunk about 3/4 inch. The silver throat covers this for display. 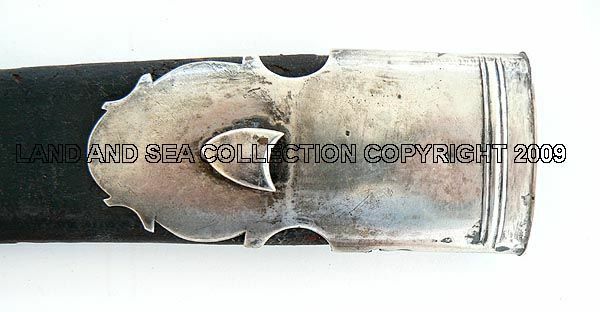 The scabbard is complete with its silver mountings, including the tip all of which are engraved on the obverse side only. Both the two carrying rings are missing. The leather body shows cracking and crazing overall, but the stitching is all present and tight. There is a small " section on the top right behind the tip which has been cut through. OVERALL CONDITION: The grip is slightly loose. 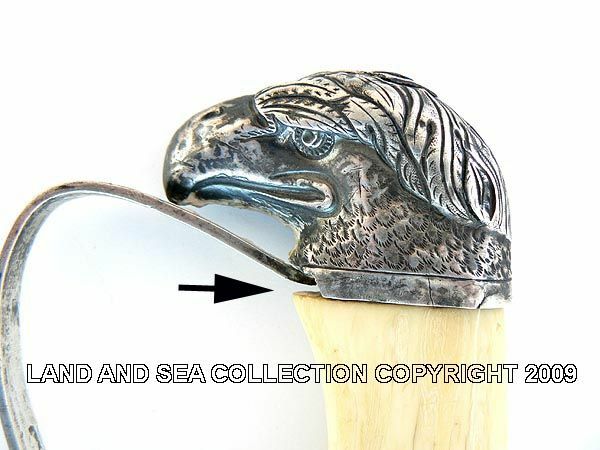 There is one small piece of silver missing where the guard joins the eagle head. The scabbard has shrunk 3/4", but the throat can cover this. It has the normal cracking to be expected, but all its stitching is present and tight. There is a cut on top just behind the scabbard tip. Both suspension rings are missing. There are small nicks on the forward edge of the blade. International buyers welcome, but must inquire first. You are responsible for knowing the import laws of your country. We have satisfied customers in Argentina, Australia, Austria, Belgium, Bermuda, British Virgin Islands, Canada, Chile, China, Czech Republic, Democratic Republic of Congo, Denmark, Estonia, England, France, Germany, Greece, Holland, Hong Kong, Hungary, Iceland, Ireland, Israel, Italy, Japan, Kuwait, Latvia, Malaysia, Martinique, Mexico, New Zealand, Norway, Nova Scotia, Panama, Poland, Portugal, Puerto Rico, Romania, Saudi Arabia, Scotland, Singapore, Spain, Sweden, Switzerland, Thailand, Turkey, United Arab Emirates, USVI and the Eastern Caribbean.